For a variety of reasons, women are waiting longer than ever to attempt to achieve a pregnancy. At the same time, age is a leading determinant of fertility. Fertility in women is greatest when they are between 20 and 28 years of age. By the age of 35, a woman’s chance of conceiving per month is decreased by half. By age 45, the natural fertility rate per month is reduced to only 1%. Due to the recent success of egg preservation studies, NCCRM is now able to offer fertility preservation services through egg freezing to women 38 years of age and under. Though egg freezing is still considered an experimental technology, data has become available to justify its use with more than a hundred babies born in the United States as a result of egg preservation. It is likely that women can continue to expect age-related outcomes from fertility preservation. For example, if a 37 year old freezes her eggs, she can expect a pregnancy rate typical for 37 year olds (35%) when she thaws, inseminates and transfers the resulting embryos. The process begins with a consultation with one of our physicians, followed by prescreening lab work (hormonal lab testing, pre-conceptual screening, ovarian and uterine evaluation, etc.). The patient will then meet with a nurse, who will outline the stimulation process and provide medication injection instruction. When the targeted cycle starts, egg production will be stimulated with the fertility medications. Frequent lab work and ultrasounds are done to monitor egg growth. When appropriate, a final injection will be given to mature the eggs and ready them for retrieval. Thirty-six hours after the injection the eggs will be retrieved vaginally under intravenous sedation. 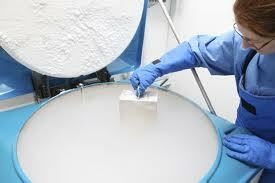 After the eggs are retrieved, the IVF laboratory will freeze and store them for the patient’s future use. The entire process from screening to freezing will last approximately two months. The price for this procedure is $4000, which does not include required pre-screening or stimulation medication. Some of the cost of this procedure may be covered by your insurance. See Dr. Sameh Toma and his patient featured in this news story on WNCN-TV in Raleigh, NC about women choosing to freeze their eggs for a variety of reasons, including career, relationship status and more.